"I am an enjoyer (not really a collector) of classics. I enjoy working on them as much as anything, drives my wife crazy. I discovered Jim's Classic Garage on Hemmings Motor News which I subscribe to on my email. He had a 1940 Chrysler Windsor that really caught my eye, nowhere near show quality, barely even a driver, but a solid car to work on and enjoy. The thing that impressed me the most about Jim and his crew was their attention to this sale, their assistance with shipping and all around general good nature. This was not a real money maker for Jim by any means, we're talking a $6000 car here, but I felt just as well taken care of as if I had been buying a $42000 Corvette. I hope to continue to keep in touch with Jim and build on a friendship that started with this business deal. Jim is a straight shooter, there is no fluff or baloney, what he shipped me was exactly as advertised. Whatever your classic car needs might be, you won't do much better than Jim's Classic Garage." "I collect 1950’s open two-seaters and right now have eight in my collection. Jim and his guys have worked on several of them, and I have always been extremely happy with both their work and their pricing. Some of my cars are a bit esoteric, but that hasn’t stopped Jim from doing his research, learning my cars, and then doing excellent work. I can highly recommend Jim and his guys to any classic car owner who wants his or her classic car well maintained. As with all extremely good classic car shops, Jim’s is very busy, but that workload has never interfered with Jim getting my cars back to me in a timely fashion. I’ve also been in great need of storage assistance as I’ve built my garages to house my collection and Jim, purely out of generosity and concern, helped with that as well. Whenever I visit the shop everyone makes me feel right at home and they’re always willing to spend time with me discussing options and plans going forward. I highly recommend Jim’s Classic Garage—super guys." "As a dedicated multi-car classic collector, I searched long and hard for a quality service shop where I felt comfortable letting my investments be worked on and cared for by others. After doing my research, and visiting Jim's shop on several occasions I was convinced I could trust in his service and would be pleased with the outcome. While any shop can claim to do quality work, I feel its the complete service package that is the most important feature and the area where Jim and his team excel. The staff at Jim's Classic Garage is knowledgeable, courteous, and friendly. They truly care about every aspect of the collector car hobby and it shows in their service. As part of my due diligence I observed the shop on several occasions, and always found it clean and organized. One of the other areas I was impressed with is the communication. Jim would call or text with updates along the way which was greatly appreciated. His updates included pictures so I could feel comfortable of any work needed. The work completed was top notch and the car was clean and ran perfect when picked up. I even got a follow up call from Jim making sure all was good. I highly recommend Jim's Classic Garage to service your classic. I know I will use his services again and I am confident my experience, as well as yours, will be to your satisfaction." "We purchased a disassembled 1949 Cadillac Coupe De Ville from Jim. I found the car for sale on eBay. I knew the car from previously looking at it at the former owner's house. I watched it for some weeks on eBay and finally called when it had not sold. Jim was easy to talk to from the first conversation. After a period of time my wife and I went to look at the car and see if we could make a deal after another car on the other side of the country fell through. We made a deal with both us happy and since this car was totally dissembled there was lots of work to do after the sale to get it all moved out. Jim was very accommodating to our every request for moving the parts which had to happen on weekends. He even offered to have some of his crew help with the loading, but that turned out not to be necessary. Jim did help with both pickup trips. From our experience we can recommend Jim for any of your buying and selling of classic cars." "It was a pleasure doing business with Jim’s Classic Garage. I was impressed with how smoothly our transaction went and I look forward to doing business with you guys in the future and thank you for being so easy to work with!!" "My red '56 GMC classic truck loved being in Jim's Classic Garage. It reveled in the TLC it got to so many of its leaking, aching and slipping parts and it was thoroughly entertained listening to Jim and the crew there educate me in the nuances of carburation, fuel filtration, transmission linkages, rust management and so on. In the end it runs better than it has in the 15-20 years I have had it. As for me- I just had fun and will miss an excuse to go by the shop to see what they are up to on my truck as well as all the others." "Jim and his crew did a wonderful job of restoring my '69 Mustang to the way it looked when I bought it 46 years ago. He kept me informed throughout the process and was amenable to my wishes." "I am so glad that I had Jim sell my 1967 GTO. I could not have done this on my own. Jim was so good to work with. He took my car to his classic garage and went over every detail so that I could get top dollar on the sale. He was so helpful in contacting various buyers that my car sold within two weeks." 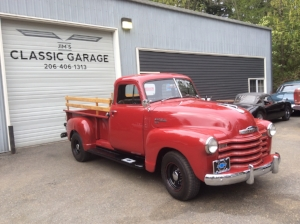 "Jim, Madison, and the entire team were professional from start to finish with selling my '51 Chevy 3600 truck. The mechanics did a great job evaluating the condition and recommending the right things to insure the best possible outcome for both myself and potential buyers. Jim has an excellent network in the classic car market and worked hard finding a good buyer. I would gladly recommend Jim to both sellers and buyers with confidence. Very positive experience." "This letter is written to express my satisfaction with the work you have performed on my 1948 Plymouth. Until being referred to you, I had been unable to find anyone capable of performing a simple routine service, let alone anything requiring mechanical or body work. I'm happy to say that I have found you and your staff to be knowledgeable in your handling of problems related to these old cars, and that your work has been realistically priced. The car always looks a litter better when I pick it up than it did when I came into the shop. Messing about in old cars should be fun, and you folks help to keep it so." "My name is Rod McGee and I was trying to sell my 1992 Corvette Convertible myself. After 4 weeks of little interest I saw an ad for Jim's Classic Garage in the Gig Harbor Living Magazine. They rebuild classic cars and also take consignments. So I decided to give them a try. They detailed the car and it looked brand new. They also took 30+ photos of the car. Top, Bottom, all sides, undercarriage, suspension and interior. They posted it on eBay and Huntington motors. My car sold within 3 weeks. They are great to work with." "I want to take this opportunity to tell anyone who is interested in selling their collector car that Jim's Classic Garage is the place to go. His professionalism is beyond reproach. Jim will do whatever it takes to accomplish a job in a very timely manner. I would not hesitate in referring Jim's Classic Garage to anyone who has an interest in selling their collector car." "I contacted Jim Sullivan at Jim's Classic Garage to ask him about handling my 1963 T-Bird for sale. I wasn't aware of Jim, his company and their love of all things cars. It has been a pleasure working with him and his crew from the first phone call through final sign off of title. They are fun, knowledgeable professionals who love classic cars and are sensitive to each unique store of car, seller and buyer. Expertise and trust are 100%. Car sold in first week and I know I cried when he called me; it was beyond all my expectations. I am delighted and am recommending them to all of my friends." "I have bought the poppy red Mustang about two months ago. I could already make some wonderful springtime-trips. As you can see, I just changed the tires to original. I just wanted to give you a short feedback. The mustang has now completed its long journey from the US to Switzerland and we both have a lot of fun together. If you have the opportunity, I would be glad if you could tell me some more details about its history. You've done a great job! I wish you well and thank you in advance." "We purchased our very first classic car from Jim Sullivan at Jim's Classic Garage and it was the best experience we could have ever hoped for! We were a bit nervous about making this type of purchase due to not knowing a whole lot about "classic" cars. However, I am thrilled to share that Jim made it an easy and comfortable process for us. He has been so wonderful to work with! His extensive knowledge, solid work ethic and expertise are absolutely top notch! We were so appreciative and grateful that we were lucky enough to have found Jim. My comfort level and trust is 100% with Jim Sullivan. In the future, we will ONLY be working with Jim's Classic Garage for all of our car needs for our beautiful 1960 Ford Fairlane 500. The experience and journey has been amazing and we owe it all to Jim Sullivan." "We have purchased two cars from Jim's Classic Garage (1966 Corvette & 1963 NOM Corvette). We used the 1966 Corvette as a trade-in toward the purchase of the '63 Corvette. The restoration work and overall condition of the '63 Corvette is of the highest quality. Jim Sullivan owner of Jim's Classic Garage prides himself in the quality of his work. He Stands behind his work and does whatever it takes to make sure his buyers are completely satisfied with their purchase. He is very accessible, easy to talk to and takes the time to understand your car needs and interests. He knows what he is doing and this is why Jim's is the only place we will have our Corvette serviced. We would recommend Jim's Classic Garage to anyone in the classic car market." "I was very satisfied with the work that Jim did in helping me to sell my 1947 Hudson. I had been trying to sell it on my own for over a year and a half with no luck. I knew that it was going to be a hard sell because it really is a unique car that needs that special buyer. Jim was upfront and honest with me about the challenges we could face, as well as what we could expect along the consignment process. We were able to get my car advertised and sold within 4 months of me dropping it off at his garage. During the time that my car was with Jim, we were able to stay in contact by phone so I knew how the advertising and sale was progressing and didn't feel left out of the loop. Once a buyer was found (across the country), Jim was able to help facilitate all the haggling, paperwork and shipping for us to help make this as easy a process as it could be. A big thank you to Jim and his staff for all their hard work, and if I am ever in the market for another classic I know Jim's Classic Garage will steer me right." "Quick Service. Did extra few little things before I left with no charge. Will be coming back for the rest of my Chevelle's needs." "My name is Rick Shafer and I am president of the Avanti Owners Association International (AOAI). I wanted to add my personal thanks to you for your very generous offer to get Andrew's Avanti running again. It is a very heart warming thing that you and your students are doing. This is truly a 'feel good' moment and I wanted to say thank you from all of us."